Self hypnosis is a tool in which you can put yourself into a trancelike state in order to make changes on a a subconscious level. This is a very important tool for self-improvement because when you try to talk yourself into changing negative thought patterns, you may find it’s not working and you don’t know why. The reason practicing positive thinking doesn’t always work is because there are often self-limiting beliefs affecting you on a subconscious level. You may be somewhat aware that you are getting in your own way, but you’re not quite sure how you are tripping yourself up, let alone how to stop it. How can you control patterns that you may not even be aware of? The term self hypnosis may be intimidating to some people. When you think of hypnosis, you may think of some silly demonstration that you attended where people did things that they would have never done if they had not been in an altered state. You may have seen shy people dance on tables, or people do bizarre things such as bark like a dog. 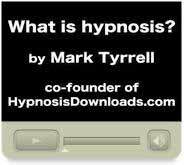 Self hypnosis is a tool for self-improvement. You will be in total control, and there is no chance that you will end up indulging in bizarre behavior. It is a trancelike state similar to meditation or daydreaming. Another term used for this type of trancelike state is “autosuggestion”. Your goal is to make suggestions to yourself for the purpose of improving yourself on a very deep level. Typically affirmations are used with self hypnosis to manage stress and build self-confidence. If you want to use affirmations while going into a trance like state, prepare them ahead of time. Going into a hypnotic state requires the ability to quiet the mind and focus. In your mind, choose a favorite place that you like to go and imagine you are there. Slow your breathing and imagine the warmth of the sun on your face, the smell of fresh flowers or saltwater…whatever is your personal escape. Another way to attain a deeply relaxed state is to focus on relaxing one muscle group at a time, first your head, then your neck, trunk, arms, legs…gradually relax yourself from head to toe. Once you attain a state of total relaxation, you can make suggestions to your subconscious mind, such as the belief that you no longer want to smoke, or that you have the confidence to face whatever you are afraid of – asking for a date, going on a job interview, etc. Or from this state of total relaxation, begin your affirmations. Stay in this relaxed state as long as you can. A typical self hypnosis session is about 15-20 minutes. Being able to remain relaxed and focused will take practice, but it will be well worth the effort. Being able to hypnotize yourself allows you to reprogram your mind. This skill will allow you to attain any goal and get past any negative thoughts or feelings. This is a tool that will allow you to truly take charge of your life and yourself.